Step off the beaten path and head to Panathenaic Stadium and Walking tours. There's lots more to do: get great views at Mount Lycabettus, stop by Kerannymi Greek Traditional Products, explore the ancient world of Temple of Athena Nike, and savor the flavors at Food & Drink. Inspirock's itinerary builder makes planning a Athens trip simple and quick. If you are flying in from Iceland, the closest major airport is Eleftherios Venizelos International Airport. Expect a daytime high around 34°C in September, and nighttime lows around 24°C. Finish your sightseeing early on the 10th (Tue) to allow enough time to travel to Mykonos Town. On the 11th (Wed), enjoy the sea views from Armenistis Lighthouse, then kick back and relax at Kalafatis Beach, then experience rural life at Mykonos Vioma Organic Farm, and finally stop by 100% Mykonos. On the 12th (Thu), you'll have a packed day of sightseeing: kick back and relax at Agrari Beach, enjoy the sand and surf at Fokos Beach, then make a trip to Rarity Gallery, and finally take in the exciting artwork at Dio Horia. For other places to visit, reviews, and other tourist information, read Mykonos Town itinerary planner . Traveling by combination of subway and flight from Athens to Mykonos Town takes 2.5 hours. Alternatively, you can do a combination of taxi and ferry; or do a combination of flight, taxi, and ferry. Traveling from Athens in September, expect nights in Mykonos Town to be about the same, around 24°C, while days are a bit cooler, around 30°C. 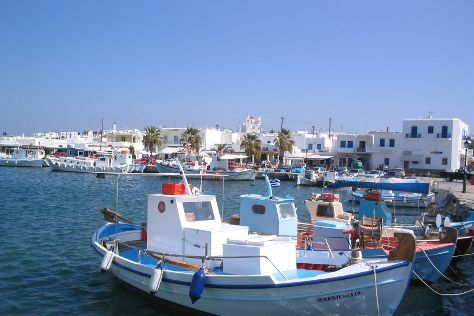 On the 13th (Fri), wrap the sightseeing up by early afternoon so you can ride a ferry to Paros. On the 13th (Fri), enjoy the sand and surf at Krios Beach. Get ready for a full day of sightseeing on the 14th (Sat): take an in-depth tour of Archaeological Museum, then enjoy the sand and surf at Lageri beach, then pause for some serene contemplation at Monastery of Agios Antonios, and finally kick back and relax at Piso Aliki Beach. For more things to do, reviews, photos, and other tourist information, go to the Paros trip planner . You can ride a ferry from Mykonos Town to Paros in an hour. Expect a daytime high around 32°C in September, and nighttime lows around 24°C. On the 15th (Sun), wrap the sightseeing up by early afternoon so you can ride a ferry to Naxos. Start off your visit on the 15th (Sun): take in the architecture and atmosphere at Panagia Drossiani Church. Here are some ideas for day two: identify plant and animal life at Alyko Beach and then stroll through Maragas Beach. To see ratings, traveler tips, and tourist information, use the Naxos trip planner. You can ride a ferry from Paros to Naxos in an hour. 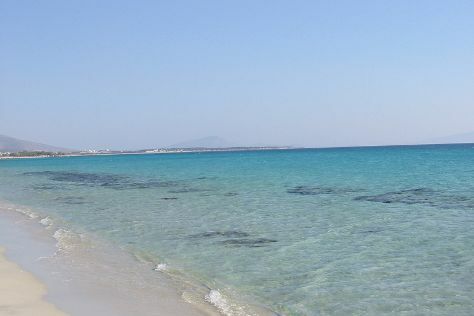 In September, daytime highs in Naxos are 32°C, while nighttime lows are 24°C. Finish up your sightseeing early on the 17th (Tue) so you can travel to Oia. You'll discover tucked-away gems like Wine Museum Koutsogiannopoulos and Venetsanos Winery. You'll find plenty of places to visit near Oia: La Ponta (in Akrotiri), Scuba & Snorkeling (in Perissa) and Cultural Village (in Pyrgos). The adventure continues: soothe aching muscles at some of the top local wellness centers, take in the spiritual surroundings of Orthodox Metropolitan Cathedral, take in the pleasant sights at Oia's Main Street, and step into the grandiose world of Byzantine Castle Ruins. To find traveler tips, reviews, maps, and more tourist information, you can read our Oia vacation maker app . You can ride a ferry from Naxos to Oia in 2 hours. Alternatively, you can fly. In September, plan for daily highs up to 32°C, and evening lows to 24°C. Wrap up your sightseeing on the 21st (Sat) early enough to travel back home.